While the market is still facing the consequences of the last GDP readings, USDCAD is under the influence of some economic reports such as PCE Core (M/M), PCE Core (Y/Y), PCE Deflator (Y/Y), Personal Income and Personal Spending in the US and the Manufacturing PMI (M/M) in Canada. 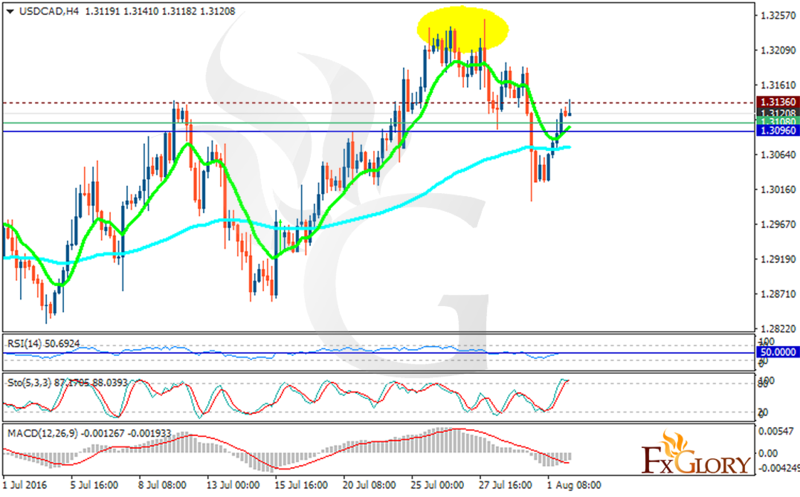 The support rests at 1.31080 with resistance at 1.31360 which both lines are above the weekly pivot point at 1.30960. The EMA of 10 is moving with bullish bias and it is located above the EMA of 100. The RSI is moving on the 50 level, the MACD indicator is in positive territory showing the price growth and the Stochastic is moving in higher ranges as well. The price will grow up to 1.3200 however the 1.31 area seems to be a strong support area.